7 Things you Need to Know About Commbank’s Decision to Move Away from Coal! The Chairperson’s address is a formal investor announcement and was also posted on the Australian Stock Exchange. If Commbank decided to invest in a new coal mine after having made that statement, investors could rightly complain that Livingstone had misled them, which is against the law. To achieve a reduction in Commbank’s coal funding, not only would Commbank have to stop investing in new coal mines, but they would also have to sell down their existing debt or let existing contracts expire. The former head of equity research at Citibank, Tim Buckley, who is now the Director of Energy Finance Studies at the Institute for Energy Economics and Financial Analysis, saidthat the announcement meant that “the bank is unlikely to lend to new large coal projects”. Rob Henderson, former chief economist at NAB, said the statement appeared to rule out funding of any new large projects. #2 This is a people powered win! Commbank has been under pressure since March to rule out new coal projects. Over 100,000 of you have called on Commbank to dump coal. There have been dozens of branch actions around the country, hundreds of posters put up, hundreds of conversations with bank staff, and thousands of comments on their social media pages. There have also been multiple banner-drops and mass gatherings at their headquarters in Sydney, their logo was taken to the coal-stacks that they fund at the world’s largest coal port in Newcastle, and we delivered coal to both their headquarters and their AGM! 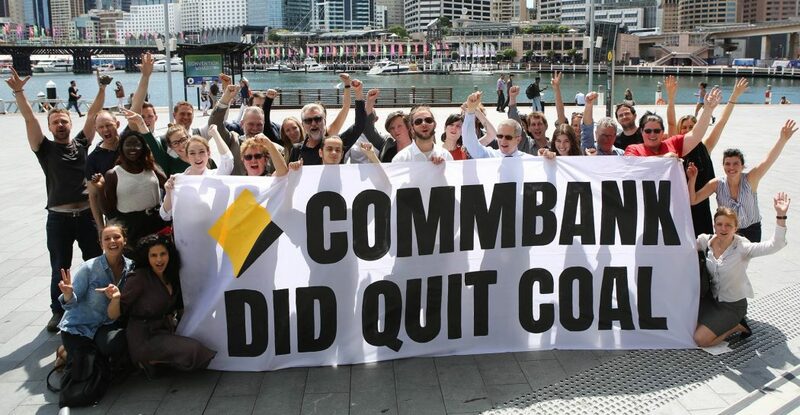 Commbank even had their own shareholders take them to court over climate change. #3 Why is Commbank doing this? Yesterday’s announcement made sense both from an environmental point of view as well as a financial point of view. Governor of the Reserve Bank Mark Carney as well as APRA director Geoff Summerhayes have both pointed out that banks have to take climate change risks into account to fulfill their obligations to their investors. They include the risks that assets will become “stranded” or lose value because of the transition to renewable energy, as well as the risk to banks’ reputations by funding projects that damage the climate. The bank would not have made this announcement without public pressure – but it is not the first bank to do so, and it will not be the last. Globally, fourteen banks including ING and JPMorgan Chase have ruled out funding to new thermal coal mines. And today, the Norwegian sovereign wealth fund, NBIM, said that it wants to divest all of its oil and gas shares. We should expect the other three of the Big 4 Australian banks to make similar announcements soon. #4 The numbers: how much was Commbank investing in coal, and what do we expect to see now? Commbank’s total exposure at default to coal was $2.1 billion when they released their corporate responsibility report earlier this year. Since November 2015, when the bank committed to keeping warming well below two degrees, the bank has loaned $6 billion to fossil fuels, according to research by environmental analysts Market Forces. Scorecard by Market Forces comparing which actions banks have taken after committing to keeping global warming well below 2 degrees. Commbank have now said that their exposure to coal will decline. That means that if they enter into new project finance with a coal company, they will be breaking that commitment because their exposure would increase. We expect the bank to amend its climate policy to rule out new coal projects and set a date by which they will no longer be investing in coal. The bank also committed to review its exposure to fracking and to review its climate policy after they have modelled what a “well below two degree” world would look like. If Commbank does this work properly, they will have to phase out involvement in fossil fuels by 2030. 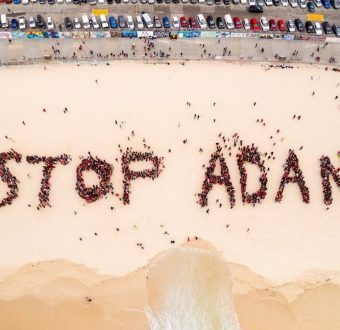 #5 What does this mean for the fight against coal in Australia? 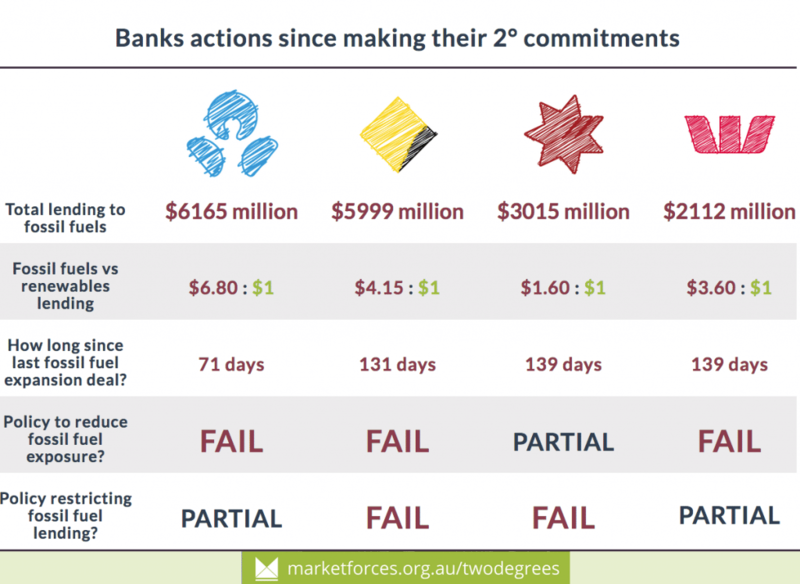 This is the biggest climate finance win ever in Australia, because the country’s largest bank (and largest public company) has effectively ruled out new coal projects. While ANZ CEO Shayne Elliot has made similar comments in the past, they were not made in a formal ASX release in front of all of their shareholders. This will increase pressure on Westpac and NAB to also rule out new coal projects. More companies will make announcements like this in the future. Companies that fail to act on climate change will face the financial and legal consequences of that failure. It is incredibly significant when banks rule out new coal projects because it changes the public conversation about the future of energy. 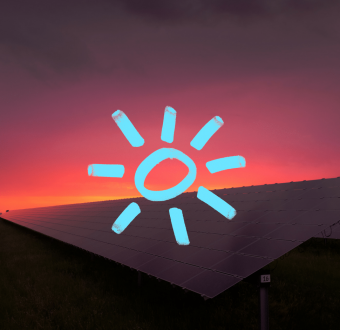 We know that it is possible to phase out fossil fuels and adopt 100% renewable energy in time to prevent catastrophic damage to the climate, and all that is lacking is the political will. A world powered by the energy of the sun, the wind and the waves means far more employment and a healthier world for all of us. Announcements like this also make it harder for mining companies to get the money they need to build toxic and destructive coal projects. #6 Is Commbank now an environmentally friendly bank? Far from it! While Commbank’s announcement is significant, they have plenty of homework to do. Firstly they need to incorporate their screen on new coal projects into their climate policy. They also need to implement a timeline for getting to zero coal based on the 1.5 degree scenario in the Paris Agreement. Commbank did not answer a shareholder question about whether they would refinance the Adani Abbot Point Coal Terminal and the bank needs to clarify that their commitment not to fund Adani extends to their coal terminal. Commbank’s investments in oil and gas are increasing and they need to adopt the same measures for all fossil fuels. Commbank also have no policy to require the free, prior and informed consent of indigenous communities for projects that they finance, and that needs to happen. Finally, executive pay should be linked to the bank’s performance on climate change. You have been part of changing the course of history in Australia and around the world! Wins like this don’t come every day and it’s important to celebrate when we do – so dance, party or go wild on social media, however you like to celebrate! We now need ANZ, NAB and Westpac to also rule out new coal projects. Head on over to their Facebook pages and ask them to do the right thing! We’ll be keeping an eye on Commbank to make sure they stick to their word and improve their climate policy until it matches what scientists are telling us is necessary to not overshoot 1.5 degrees. Finally, Greenpeace can only run these campaigns because we are completely independent from governments and corporations. We are 100% supported by members of the public like you. Chip in today to help us take on the world’s largest corporations and you can be sure that your support will make a world of difference!